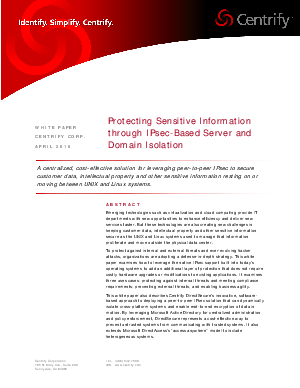 This white paper describes Centrify’s innovative software-based approach to deploying a peer-to-peer IPsec solution that can dynamically isolate cross-platform systems and enable end-to-end encryption of data in motion. By leveraging Microsoft Active Directory for centralized administration and policy enforcement, Centrify’s DirectSecure solution represents a cost-effective way to prevent untrusted systems from communicating with trusted systems. It also extends Microsoft DirectAccess’s “access anywhere” model to include heterogeneous systems.